In this episode, Danny "Sunshine" Bauer shares his thoughts on leadership development and how casting the right vision is the key to building betters teams. 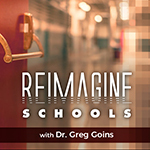 He also talks about his podcast and new book, The Better Leaders Better Schools Roadmap and how his leadership community, The Mastermind, has helped pave the way for "heroic" leadership through reflection, problem solving and facing upper limit challenges to create "magical" schools. Twitter: @alienearbud. Website: https://ift.tt/2ysxzls.